Decatur Smiles — We love teeth! 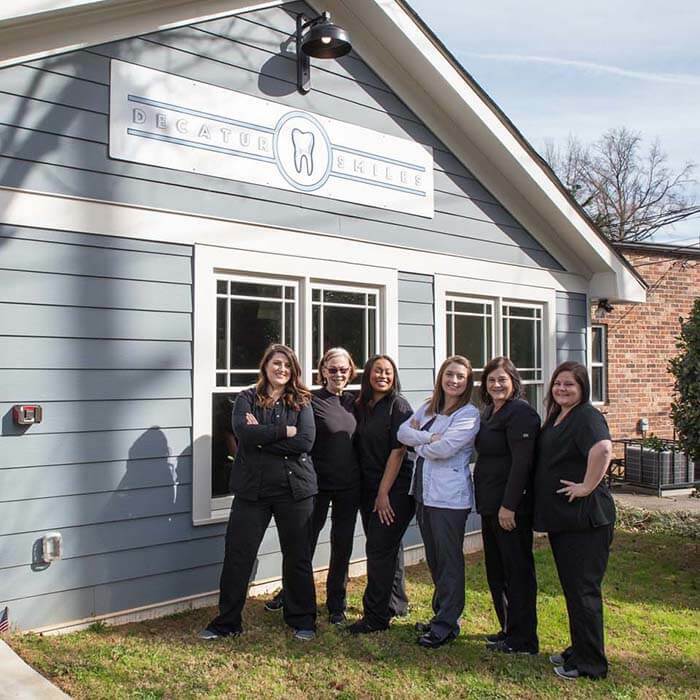 is a modern family dental practice in the heart of downtown Decatur, Georgia. 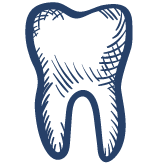 We work with both adults and children to provide the finest general dentistry care possible. We offer a variety of services including crown and bridge work, implants, Invisalign, laser dental therapy, dentures, whitening, and a lot more. Our comprehensive examination includes digital radiography, annual periodontal examination, oral cancer screenings at every appointment, and cleaning that will leave you feeling your best. Please get in touch to let us know what you need! Excellent and caring staff. Everything was explained in a clear and concise manner. In addition, Jaime did a fantastic job with my cleaning. No pain at all. Highly recommend! Myself, my wife, and our 3 year old son all see Dr. Dillon for dental care. We are so happy with the service we receive in this office. Everyone in the office is incredibly friendly and professional. The dental service itself is thorough and excellent. I had annoying coffee stains on my teeth that were completely gone at the end of my visit. I would highly recommend this office! Where has this office been all my life!? I have always been very nervous about the dentist but these women are the best! Smart, full of personality and they listen to my concerns! I cannot say enough how wonderful they are. Thanks Dr. Dillion for opening this office, it’s the perfect addition for Decatur! We take walk-ins, but if you are able to — please call ahead to give us a heads up! We take almost all PPOs, and we make our services and pricing as transparent as we can. Downtown Decatur, at 144 South Columbia Drive, Decatur GA.
We also have a Norcross location called Horizon Dental. We take cash, check, all popular credit cards (VISA, MasterCard, even AMEX), Apple Pay, Android Pay, and PayPal Credit. We work hard to make your dental work affordable by offering payment plans and transparent pricing. We offer discounts on pre-pay, in-house "four month plan" financing, and dental Care Credit. Please make an appointment or reach out to us for accurate pricing. Her Patronus is a dolphin. She's a Hufflepuff. Always reads the last chapter of every book first. Spoiler alert! The Movie Buff! No movies, no life. Know movies, know life. Started college this year, but unable to quit as she is currently too legit! Dr. Jennifer Dillon grew a strong compassion for dentistry, having been a problematic patient herself. After years in braces and orthognathic surgery, Dr. Dillon truly understands what it’s like to be on the patient’s side of the chair, and is fully committed to being the most patient-friendly dentist she can be. Dr. Dillon received her undergraduate degree in chemistry and biology from University of the Cumberlands, a small private school in Williamsburg, KY and then graduated with a Doctor of Medical Dentistry degree from the University of Louisville School of Dentistry in Kentucky. Dr. Dillon practiced in Corbin, KY before her new home in Decatur, Georgia. Ever since graduation, Dr. Dillon has made a commitment to provide the highest level of care in the gentlest manner possible along with a desire to make her patients feel entirely at ease. To book an appointment, please email us, call us, or send us a message using the form below. We would love to hear from you! Please do not send protected health information (PHI), credit card, or social security information. Please call us or visit our office for these matters. Hold on, swiftly sending your message!